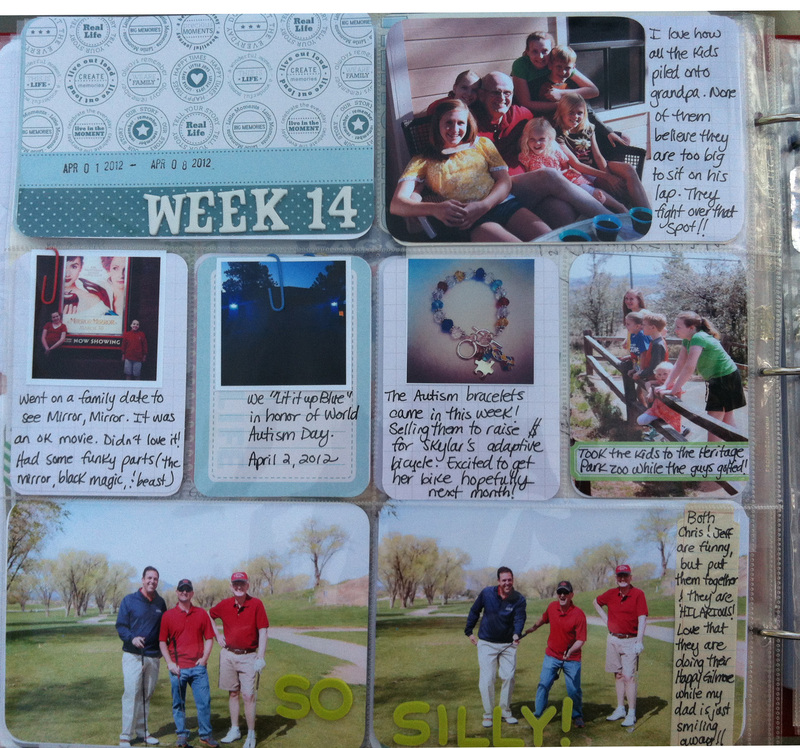 Project Life: Week 14 | I am JuJu! Oh, man! I had a blast working on my week 14 pages this morning. I’m a bit late in posting today because not only did I include Sunday in this week, but yesterday was CRAZY! I actually just put my pages together this morning. I laughed so hard as I recalled the fun we had this past weekend. We had an awesome Easter egg hunt. We had dyed eggs, plastic candy-filled eggs, & cascarones (confetti filled eggs). Even without Easter weekend we had a busy week. This week I added a baseball card protector as well as 2 6×12 inserts that include a blog post from last week. So as always, the 1st picture below is a shot of the entire layout, including the inserts. I love the left page this week as it tells so many different stories. All the kids huddled on grandpa, our family date night, a trip to the zoo, lighting it up blue for World Autism Day, the autism bracelets coming in, & the guys playing golf together. Below is the right page. Again, I used several cards from this set I purchased awhile ago. I just love these cards! I love the 2 sequenced pictures of my niece, Becca, chasing Skylar with a confetti egg. Man, they had so much fun. Lots of squeals & laughter! Here is a shot of the front of the baseball card protector. I had so many great shots from the weekend so I wanted to make sure to include them. We made resurrection rolls on Easter morning before we went to church. The kids loved it & they said they were delicious! Below is the back of the baseball card protector. I love the picture of my OLDER sister smashing the egg on her daughter. She has quite the crazed looked on her face. Totally made me laugh! I also love the picture of Hailey snatching the egg off the “Private Property” sign that sits in the middle of the field where we were doing our hunt. (That sign didn’t apply to us did it?) Cracks me up that she had her finger put up to her mouth with that mischievous look on her face. Last week I shared on my blog about my youngest daughter being diagnosed with Asperger’s. I wanted to include that post in my album. You can read that post here if you missed it last week. Here is a close-up of the left page. You can see a shot of the autism bracelet that I am giving away this week here on the blog. Click here to go to that post. Leave a comment & you are entered to win….it is that easy! You can also purchase them (details are in the post). 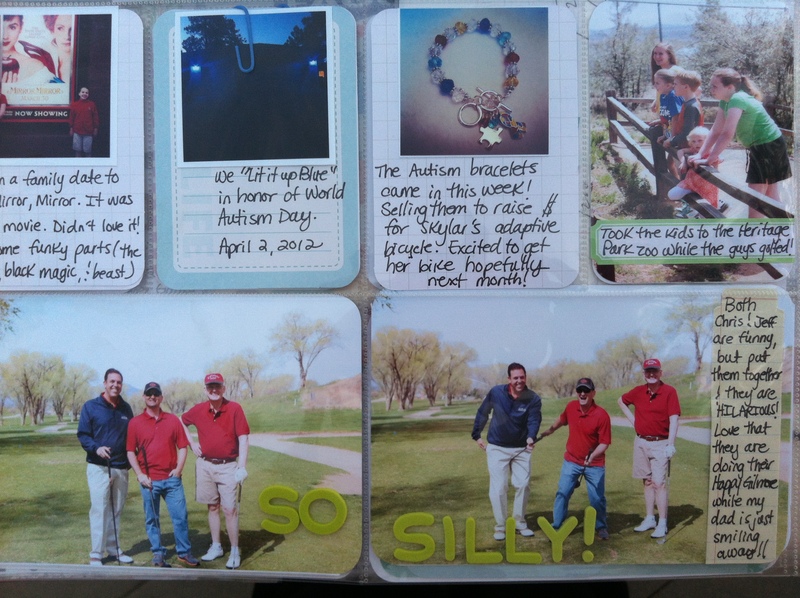 I also love the 2 shots of my brother-in-law Jeff, my hubby, & my dad at the golf course. We had to run to the golf course to switch out cars. We were thrilled when we drove by & saw them near the road. My sister jumped out of the car & snapped these pictures. I thought it was so funny that in the right picture, Jeff & Chris were doing their Happy Gilmore impressions riding their golf clubs while my dad posed perfectly for the camera. I must say that the funniest part of the whole thing was when my sister slipped while running back to the car. Her shoe came off & the kids started laughing. Don’t tell her I told you, but it was HILARIOUS! It was a great week & I’m thrilled to have it all captured & documented in my project life album. After 14 weeks, I’m loving this project more than ever! As always, I’m linking up with The Mom Creative and One Happy Mama. Head over to their pages & see all the great pages that are linked up on their sites. I hope you all have a wonderful week! Make it great! This entry was tagged documenting Easter, project life, project life week 14. Bookmark the permalink. Great pages! Love the flower journaling cards. 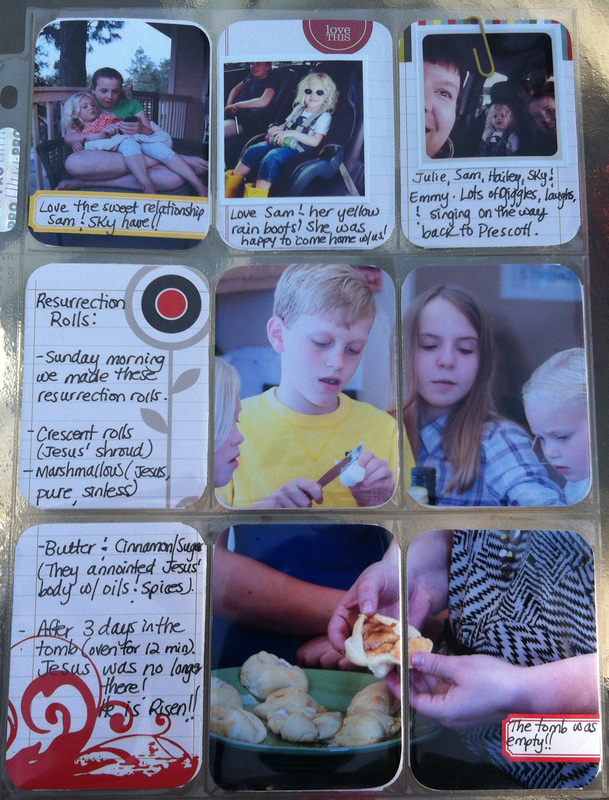 The resurrection rolls sound yummy! Love the bracelet! I hope the fundraiser goes well! 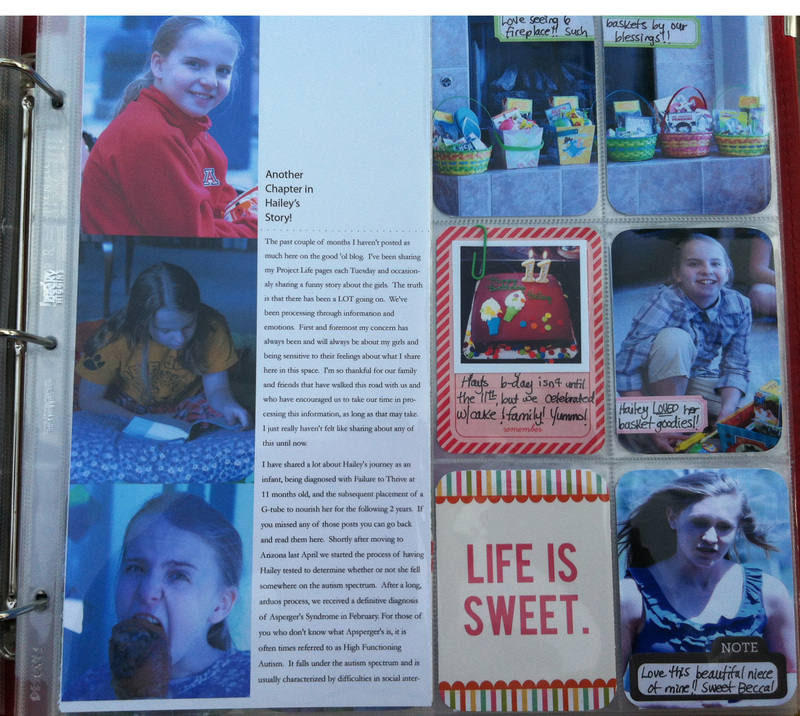 Gorgeous pages Julie – love how there is so much going on but it goes so well together. Love the photo spread across 4 slots. Wonderful pages (again). Love how they really show the heart and warmth in your family. The egg hunt spread is laugh out loud great! Thanks for sharing your story. I love the way you spread your photos and titles out. Very inspiring! LOVE LOVE LOVE!!! Looks like fun. Thanks for letting me peak into your life again. 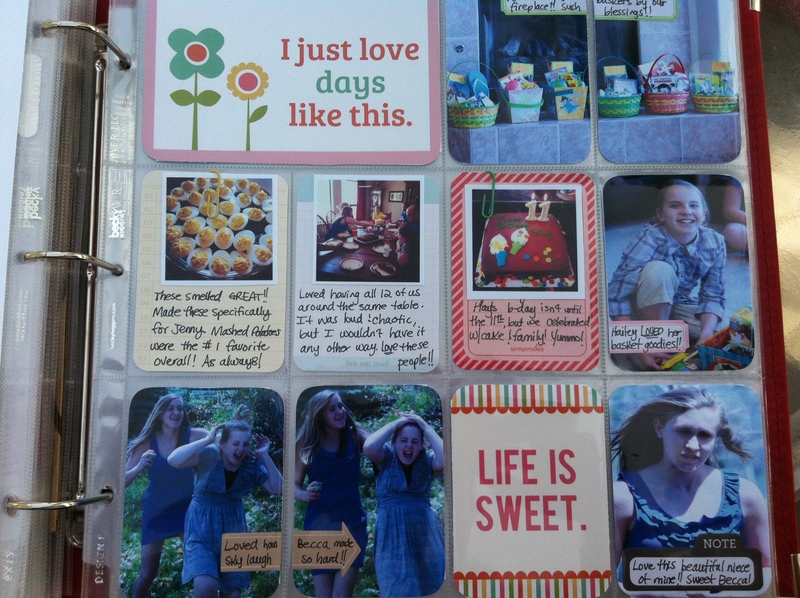 love your pages – capturing so much joy and fun! Your insert this week is really special. Such fun family pix too! Love the Easter baskets on the fire place–they fit perfect there and those resurrection rolls are really neat. I’ll have to remember that for next year. 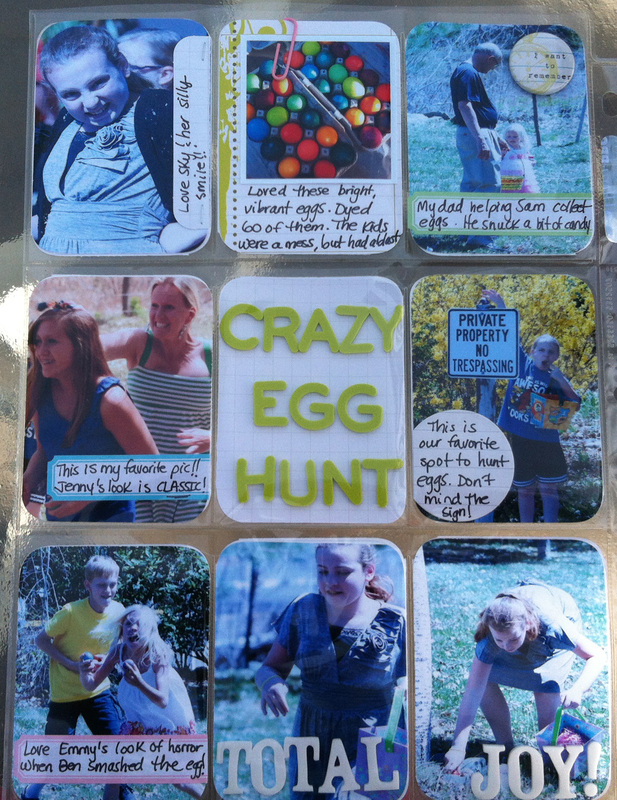 That looked like a crazy fun Easter egg hunt I would have loved to be at! Where is it that you get your square pics printed at?